Discover marvels on the Mississippi River. The Quad Cities is located just 2 1/2 hours from Chicago and is situated on the mighty Mississippi River. The Quad Cities region is made up of the riverfront cities of Moline/East Moline and Rock Island in Illinois, and Davenport and Bettendorf in Iowa. The region's population is about 500,000 and attracts over 1 million visitors a year. There are many outdoor activities to entertain you from biking and hiking trails, to beautiful parks and a large forest preserve. You can also enjoy boating, kayaking, and canoeing on either the Mississippi River or the Rock River. Additionally, the Quad Cities is home to a wealth of museums, historic sites, art galleries, John Deere attractions, performing and visual arts, riverboat cruises, three casinos, a zoo, and wonderful shopping and dining experiences. The region has over 50 hotels, 10 B&B's, and marvelous meeting and convention facilities. The Quad Cities is located in the Midwest and is known for its friendly, Midwestern hospitality and affordability. Includes Cities/Towns: East Moline, Moline, Rock Island. 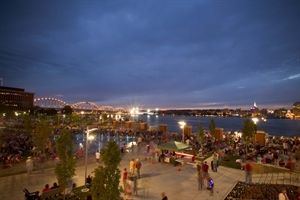 The Quad Cities is well-know for its wealth of festivals that take place throughout the year. There are also great opportunities to get out on the mighty Mississippi River by hopping aboard one of our Channel Cat Water Taxis, or the Celebration Belle Riverboat.Enjoy wine, beer or amazing spirits? Visit one of our many wineries, micro-breweries and distilleries. The Quad Cities offers numerous attractions that bring more than 1 million visitors a year to our area. The region is family-friendly, affordable, and we are known for a great hospitality. Over 20 museums are scattered throughout the Quad Cities and each offers its own unique theme and collections. In addition the region offers a wealth of art galleries and art studios that are sure to inspire the creative side of you. Live theatre options include Broadway, local theatre groups, dinner theater, ballet, and comedy clubs. Music is also a major part of the Quad Cities. Enjoy our symphony, concert tours, and intimate settings that provide classical, blues, folk, rock and more. Public transportation is available throughout the Quad Cities. MetroLink buses serve the Illinois side of the Quad Cities and offers connections to the Iowa side of the river. The buses travel to prime downtown locations, and near attractions and shopping. Bike racks are provided on the buses. The American Public Transportation Association selected Rock Island County Metropolitan Mass Transit District (MetroLINK) as an Outstanding Public Transportation System for all agencies in North America carrying between 1 million and 4 million passengers annually. Davenport CitiBus provides transportation services to over 4,500 passengers daily. The system's 16 bus routes cover approximately 30 square miles of the City, with numerous schools, shopping centers, hospitals/medical centers, local businesses and tourist attractions within easy walking distance of most CitiBus routes. Transportation options are extended by providing Bike n' Bus options on every vehicle in the fleet as well as connections with Bettendorf Transit and MetroLINK Transit systems. Bettendorf's transit system (BT) plays an important role in the overall transit network in the Quad Cities. In the area as a whole, BT links to the Davenport (Citibus) and Rock Island (MetroLink) systems, City of Bettendorf proper transit is a means to manage congestion on busy thoroughfares and offers service beneficial to employers/employees, businesses, casual travelers, students, senior citizens, individuals with disabilities, and those in economically disadvantaged situations. Numerous Physical Therapy services are also available. Jan 14.7 F° 23.0 F° 31.3 F° 1.4 "
Feb 19.7 F° 28.0 F° 36.3 F° 1.6 "
Mar 29.7 F° 39.3 F° 49.0 F° 2.8 "
Apr 41.7 F° 51.8 F° 62.0 F° 3.5 "
May 52.0 F° 62.5 F° 73.0 F° 4.4 "
Jun 62.0 F° 72.0 F° 82.0 F° 4.7 "
Jul 66.0 F° 75.8 F° 85.7 F° 4.2 "
Aug 64.0 F° 73.8 F° 83.7 F° 4.4 "
Sep 55.3 F° 66.2 F° 77.0 F° 3.1 "
Oct 43.0 F° 53.5 F° 64.0 F° 3.0 "
Nov 32.0 F° 40.5 F° 49.0 F° 2.5 "
Dec 19.7 F° 27.2 F° 34.7 F° 2.1 "
Spring temperatures are cool with averages in the low 50's and highs in the low 60's. Nights are cold with lows in the low 40's. Summer temperatures are mild with averages in the low 70's and highs in the low 80's. Nights are cool with lows in the low 60's. Fall temperatures are cool with averages in the low 50's and highs in the low 60's. Nights are cold with lows in the low 40's. Winter temperatures are cold with averages in the mid 20's and highs in the mid 30's. Nights are cold with lows in the upper 10's. There are a variety of volunteer organizations in the Quad Cities region. Volunteer opportunities range from festivals and events, chamber volunteers, schools, committees, symphony, theatre, museums, festival of trees, and more.